This paper assesses the capabilities of the Romanian Navy in light of latest military and security developments in the Black Sea. 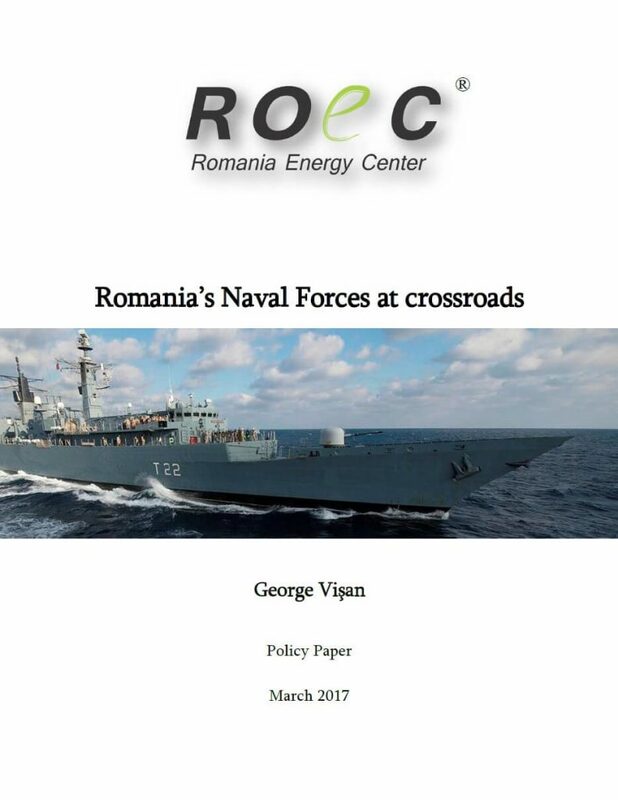 It provides an insight on the background, current shape and modernization plans for the Romanian navy and its components (the 56th Frigate Flotilla, the naval aviation capability, the 50th Corvette Squadron, the 150th Naval Missile Squadron, the 146th mine warfare squadron, Romania’s Danube flotilla, and the special ops squadron) and concludes with recommendations for the future development of the service. There appears to be no instance of a state which possesses a sea coast ignoring the fact. However minimally, some of its people will apply the resources of the sea to their environment. Thus, if power is the ability to influence events, all states with a sea coast have some maritime power. This is true in the case of Romania as well. Its main gateway to the global economy is the Port of Constanța, the largest deep water port in the Black Sea. Constanța is 179 NM (332 km) from the Bosphorus Strait and 85 NM (157 km) from the mouths of the Danube. In the long run, 9,700 square kilometers of EEZ may yield up to 70 Bcm of gas and 12 million tons of oil. Romania’s strategic position in the region is emphasized by its control of the mouths of Danube and its sprawling Delta as well as its membership in NATO and the EU. After Rhine, the Danube is the second largest European waterway and 1,075 km or 38% of its entire length runs through Romania, of which 236 km represent internal waterways. The tasks of protecting Romania’s maritime interests and securing its access to the global commons belong to the Romanian Naval Forces. Of all Romania’s military services, the navy is the smallest, it numbers only 6,600 personnel, but it is the most technically and professionally challenging of the three. The relevance of the navy’s mission is emphasized by the fact that, an aggression originating from the Black Sea or from the Danube can target and engage all of Romania’s military services or, at least, two of them either simultaneously or successively. 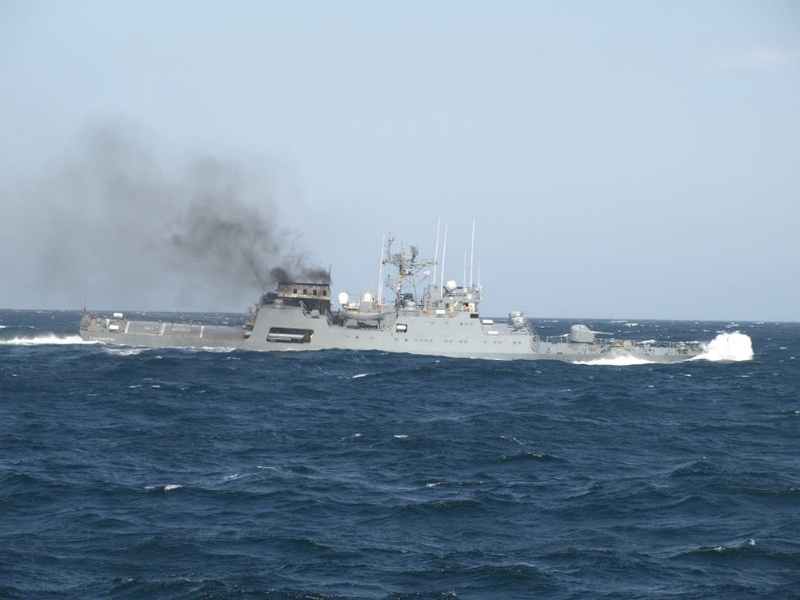 The main striking force of the Romanian Navy is, in theory, the frigate squadron – or the 56th Frigate Flotilla, as it is known in the order of battle. Its peacetime missions are sea control and maritime security. In wartime the flotilla’s missions are anti-surface warfare (ASuW), anti-submarine warfare (ASW), disrupting and restricting the enemy’s access to sea lanes, naval gunfire support and supporting other naval task forces. The flotilla is based at Constanța. The squadron is made up of three frigates and one logistic support vessel that also doubles as a training ship for the squadron. Overall it is an unbalanced force made up of old ships with limited capabilities. The backbone of the squadron are the two Type 22 (Broadsword class) frigates acquired by Romania from the United Kingdom in 2003. Despite being rated as guided missile frigates in Royal Navy service and quite capable in that role as proven in the Falklands War (1982), in Romanian service, these ships are basically large OPVs (Offshore Patrol Vessels) due to their lack of modern weapons systems. Regele Ferdinand (F-221) and Regina Maria (F-222) have yet to be fully modernized and upgraded. When the Romanian government bought these ships from BAE Systems, their legacy weapons systems have been removed. In Romanian service, these ships are equipped with 76 mm Oto Melara Super Rapid naval gun, lightweight torpedoes, heavy and light machineguns as well as an IAR-330 Puma Naval helicopter. Between 2007 and 2009 both ships should have undergone a complex modernization process as well as an overhaul – as these ships are more than 30 years old. Despite their limitations, both ships took part in international missions under aegis of NATO and the EU: Active Endeavour in the Mediterranean Sea, Unified Protector (2011) off the coast of Lybia and Atalanta antipiracy mission in Indian Ocean, off the coast of Somalia. In 2016 the Ministry of National Defense finally launched a tender for the upgrade and modernization of both frigates valued at €180 million. The ships should be refitted in a Romanian shipyard by the winner of the tender during 2017-2019. Four companies have been selected for the final phase of the tender: a joint venture between Havelsan (Turkey) and CSR SRL (Romania), Lockheed Martin Canada, Finmeccanica Spa (Italy) and DCNS (France). However, at the time of writing, the contract has yet to be awarded. However, the modernization tender faces a number of challenges that seriously affect the entire program. First, the paltry budget allocated for this important acquisition process seems insufficient: only €180 million or €90 million per ship. The funds should cover the overhaul of both ships and their fitting with modern anti-ship and surface-to-air missiles, new search and fire control radars, electronic warfare suits, sonars and modern combat information centers (CIC). In financial terms it is a very ambitious defense project, if not unrealistic. Second, the Type 22 frigates are an outdated design of the late 1970s and built in the 1980s. The Romanian navy hopes to maintain these ships operational into the 2030s, but this is a rather optimistic evaluation of their utility as surface combatants in the 21st century. After it became a NATO member, Poland acquired two Oliver Hazard Perry class frigates (roughly similar in role and capabilities to the Type 22 frigates), from the United States. Although the Polish Navy initially planned a generous modernization package for these ships, it cancelled the project in favor of a more conservative upgrade and concentrated on building new smaller surface combatants that are more adapted to the conditions in the Baltic Sea than the large long range guided missile frigates, as well as on planning the acquisition of new conventional submarines. The emphasis placed by the Romanian navy on the modernization of these two surface combatants is mainly justified by the fact that these are the only ships fully interoperable with its NATO allies and partners, can be deployed for long periods of time outside the Black Sea and, despite their age, can still provide useful service in the short and medium term. No decision concerning the frigate modernization program has been taken at the moment of writing this report, although according to viceadmiral Alexandru Mîrșu the paperwork concerning the project has been completed and awaits final approval. The third surface combatant that makes up the 56th Frigate Squadron is Mărășești (F-111) is a local design – it is the largest ship designed and built for the Romanian Navy after World War II. The ship was laid down in 1978 and was commissioned in 1985. Mărășești is the largest surface combatant of the Romanian Navy and, until the commissioning of Regele Ferdinand and Regina Maria frigates in 2003, it was the flag ship of the Romanian fleet. Mărășești was part of an ambitious naval program that was launched after 1968 by the communist regime. When commissioned, the ship was rated as a light helicopter cruiser and was initially named Muntenia. After the Romanian Revolution of 1989, the ship was renamed Mărășești in honor of the 1917 battle of the First World War (it is the second ship to bear that name) and re-rated as a destroyer. Although the ship displaces more than 5,000 tons, its range usually restricts her to the confines of the Black Sea and it has not been deployed to any international missions after Romania became a NATO and EU member. However, it regularly takes part in national and international exercises held in the Black Sea and, on a number of occasions, has been the flagship of the Blackseafor, a local naval security initiative. Mărășești lacks modern surface-to-air missiles and anti-ship missiles. Its artillery systems were designed in 1960s and in the 1970s. In 1992, during an overhaul missile launchers for 8 SSN-2C/D (P-20/21) launchers where installed increasing the ships firepower, yet these weapons are obsolete. In light of its limitations, Mărășești was again re-rated as a guided missile frigate when Romania joined NATO in 2004. 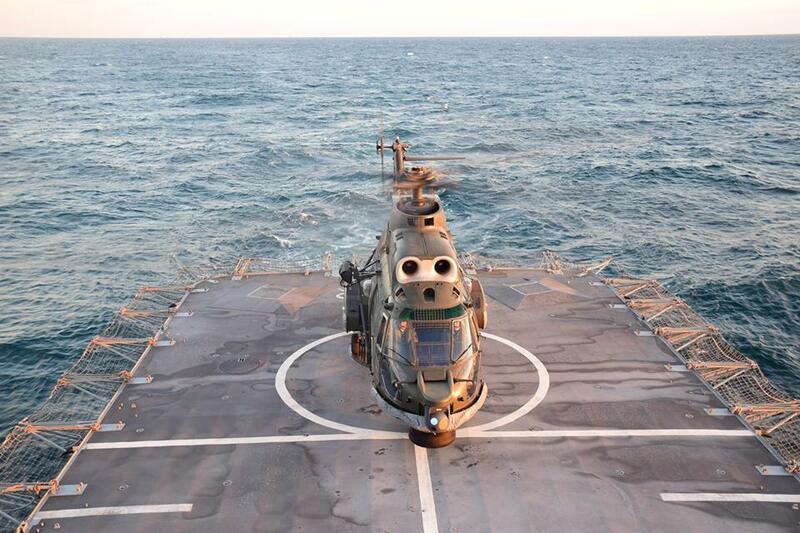 The ship has a flight deck and hangar and can accommodate a medium helicopter, usually a Puma Naval. Due to its design limitations and age, Mărășești cannot be economically modernized and upgraded. It seems that around 2018-2020 the frigate will be decommissioned and probably scrapped. According to a speech given in 2015 at an international naval reunion, admiral Nicolae Mîrșu, commander of the Romanian Naval Forces, explained that Mărășești will be decommissioned after the last of the Type 22 frigates will be modernized, which is supposed to happen around 2019. Mărășești’s place in the frigate squadron would have been taken by a new light frigate or heavy corvette. However, if the modernization and upgrading of Regele Ferdinand and Regina Maria frigates is postponed yet again, Mărășești may have to soldier on until 2020, if not beyond. The fourth member of the 56th Frigate Flotilla is the logistic support ship Constanța (281). Like the other vessels of the flotilla, it is an old ship, commissioned in 1981, designed and built in the late 1970s. The ship regularly takes part in national and international military exercises in support of the frigate flotilla. Constanța however, has not been deployed with the ships of the frigate flotilla in international missions. The ship has a landing deck and a hangar for helicopters, but no aircraft are operated from the ship. Currently, the ship is undergoing a much needed overhaul. The frigate flotilla poses a huge dilemma for the Romanian Naval Forces. On the one hand, it is the main fighting force of the navy – its iron fist so to speak, on the other hand, it is a hollow force made up of a hodgepodge of surface combatants that are near their decommissioning age and of little fighting value. 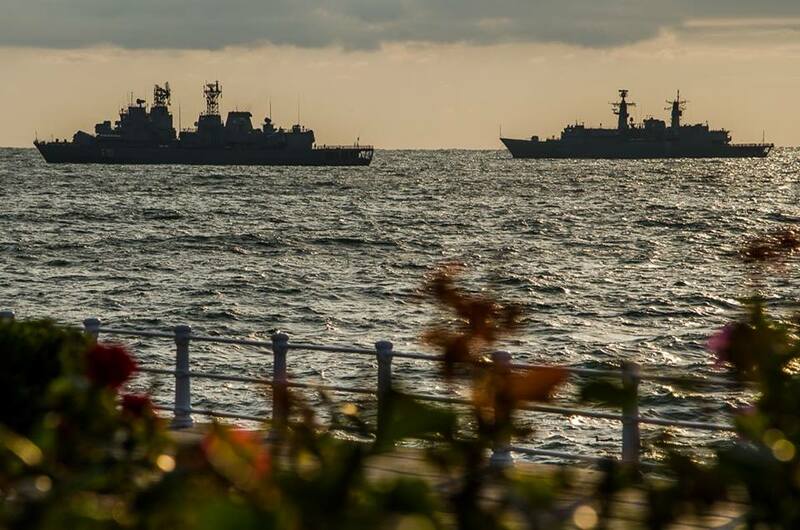 In the current Black Sea security environment, the flotilla cannot effectively serve as a deterrent against aggression and is at best a tripwire. In short and medium term, the main challenge for the flotilla in order to remain operational is the refit of the two Type 22 frigates. It seems that the upgrade process will begin in 2017 after the winner of the tender is finally announced. In the long term, however, the main challenge is developing the flotilla into an effective fighting force. The creation of a naval aviation capability has been one of the most significant developments for the Romanian Naval Forces after joining NATO. It was spurred by the acquisition of the Type 22 frigates which possess generous aviation facilities and by the navy’s own operational requirements. The group was created in 2006 and is based at Tuzla airfield. For the first time since 1960, the Romanian navy had its own organic aviation arm and did not have to rely on the Romanian Air Force for support in specific air missions. It took nine years (2006-2015) to generate a naval aviation nucleus around three helicopters. Part of the answer for such a long process lies with the fact that the Romanian Navy had to build its naval aviation arm from ground up – and that usually takes time. The other part of the answer has to do with the amount of resources allocated to the program. The development of the Helicopter Group unfortunately coincided with the economic crisis which meant fewer resources were allocated to the program and delays in sensor upgrades and weapons acquisition. 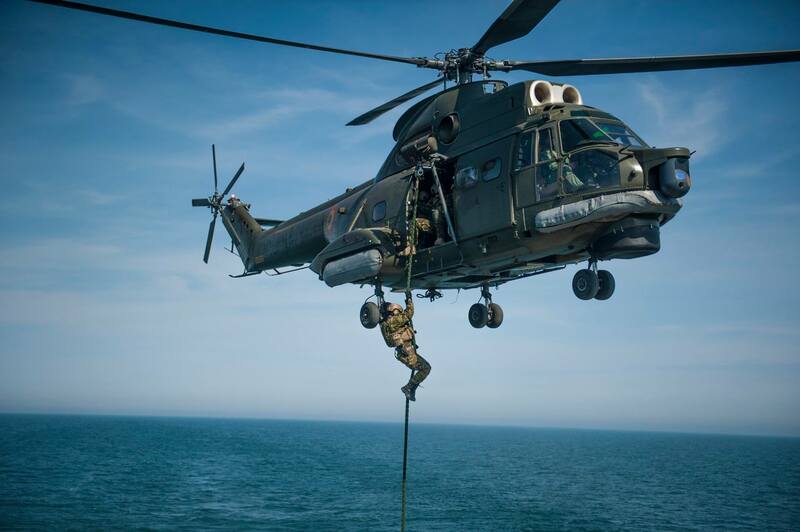 The group consists of just three IAR-330 Puma Naval helicopters specifically designed for maritime operations and are flown by naval aviators drawn from the ranks of the Romanian Naval Forces. These helicopters are licensed built versions of the proven SA-330 Puma design for which Romania obtained a production license in 1968 from France. IAR Ghimbav, Romanian’s main helicopter manufacturer, has been responsible for the design and production of the Puma Naval as well as the integration of various avionics and weapon systems. All three helicopters were built between 2006 and 2008 and went through a series of incremental upgrades until 2015, when the program was stopped and entered its long term support phase. The main mission of the naval helicopter is to extend the ship’s sensor coverage. Where the Puma Naval prove their usefulness is in ASW missions by detecting, tracking and attacking enemy submarines in cooperation with the Type 22 frigates or with Mărășești (F-111). With the help of the Pumas, frigates can safely engage submarines from long range. For ASW missions the Puma Navals are equipped with sonobouys as well as radar and forward looking infrared (FLIR) to detect submarines on the surface. Once detected, the submarines can be engaged with lightweight torpedoes. Other missions that can be performed by the helicopter group are: maritime and riverine reconnaissance, search and rescue (SAR), combat search and rescue (CSAR), vertical replenishment at sea (VERTREP), insertion and extraction of special forces and/or combat divers, as well as limited anti-surface warfare (ASuW). There are however caveats to the capabilities of the Helicopter Group. For example, the greatest limitation in ASW missions is the lack of a dipping sonar as the helicopters are not equipped with a four axis autopilot. ASuW is limited to relaying information to the “mother ship” or in extreme cases to engaging targets with the door mounted machine gun, as the helicopters are not equipped with light anti-ship missiles. Moreover, the Puma Naval are somewhat underpowered which limits their performance in “hot and high” conditions, reduces their range and imposes limits on their maximum take-off weight. The Turmo IV engines which equip the basic IAR-330 helicopter should be replaced with Makila turboshaft engine, an upgrade that IAR Ghimbav has already performed for export customers. However, neither the sensors nor the engines are the greatest operational challenge for the Helicopter Group, it is their number. Three helicopters are just not enough to provide a credible operational capability. In theory, having three helicopters means that one will be available at all times, another would undergo maintenance and one would be available for training. Yet, helicopters are not as robust as naval ships and it is more than probable that situations may appear where not one, but two aircraft would be undergoing maintenance. Given the challenging environment of naval operations, safety lies in numbers – a Helicopter Group consisting of four or even six aircraft would be able to better maintain its operational capability in case of accidents or mishaps than one made of just three. The limited number of aircraft is in direct relation to the number of ships that have operational aviation facilities. Yet, in operational terms there was nothing to stop the Romanian naval staff or the Ministry of Defense (MoD), other than the lack of resources, to develop a larger naval helicopter force, even if part of it was land-based. Although the naval helicopter program in the current form has been discontinued, it is likely to be rethought and restarted in the near future. First, Romania plans to acquire four new corvettes and those ships will require helicopters. Second, restarting the program will be much easier as Airbus has opened a new helicopter facility in Brașov for building Airbus H215 civil helicopters and H215M military helicopters. The Romanian Navy can opt for a naval helicopter based on the H215M or can order other types that can be assembled and maintained locally such as the NH Industries NH90 or the AS565 Panther which are also in Airbus’s portfolio. If the frigate flotilla is the main striking force of the Romanian Naval Forces, its workhorse is the 50th Corvette Squadron. In contrast with the frigate flotilla it is a much more balanced force, yet as in the case of the latter, it is made up of obsolete ships of limited fighting value. The primary mission of this unit is antisubmarine warfare while anti-surface warfare comes second. The ships of the squadron are tasked with patrolling Romania’s EEZ and securing the sea lanes. All the ships of the squadron are designed and built in Romania during the 1980s and 1990s: 4 corvettes and 3 torpedo-boats. The mainstay of the force are the four corvettes which belong to the Tetal-I and Tetal-II classes (Project 1048 and Project 1048M). The squadron is based at Mangalia, south of Constanța. The three Epitrop class torpedo boats are based on the hull of the Soviet OSA class fast attack craft and are similar in this respect with the Shershen class torpedo boats (they even share the same armament fit). The fast attack crafts have been attached to the squadron in order to increase its anti-surface capabilities however, they bring little in this respect. Making a torpedo run against a state of the art surface combatant nowadays would be suicidal, even with heavyweight guided torpedoes. Initially, 4 Tetal-I (Project 1048) corvettes had been built and operated by the Romanian Navy, however, only two are currently in service: Amiral Petre Bărbureanu (260) (the lead ship of the class) and Viceamiral Eugen Roșca (263). The design of these ships was probably inspired by the small anti-submarine vessels of the Soviet Navy built during the Cold War, of which Romania operated a few. However, the Tetals are considerably larger (1,400-1,600 t displacement) and are locally designed and manufactured, while their weapons and electronics are of Soviet origin. The Tetal-II (Project 1048M) is an upgraded design based on the same hull, with a new weapons fit and a helicopter landing spot for a light helicopter. As in the case of Tetal-I class, four ships were planned, but only two were ever commissioned. The lead ship of the class Contraamiral Eustațiu Sebastian (264) was laid down in 1983 and commissioned in 1989. Incidentally, the second Tetal-II corvette, Contraamiral Horia Măcelariu (265), is the last naval ship designed and built in Romania for the Romanian Naval Forces. Launched in 1991 the ship was finally commissioned in 1996. After that, Romania basically took a naval building vacation that has yet to end. Originally, the ships could accommodate and support Alouette III helicopters (IAR-316B) of the Romanian Air Force tasked with aerial reconnaissance and anti-submarine warfare. However, at present the two Tetal-II corvettes do not operate with helicopters and the navy’s Pumas cannot land on the ships as they are too heavy. Tetal-II’s weapons systems are slightly more modern than those employed by the Tetal-I ships and some of the electronic systems may have been locally designed and built. Modern communication and navigation systems have been added to all of the Tetal corvettes in order to facilitate operations with NATO ships and naval groups, otherwise no major refit has been carried out. The squadron’s capabilities to conduct its primary mission, anti-submarine warfare (ASW) as well as its secondary mission, anti-surface warfare (ASuW), are limited by the obsolete weapons and sensor suits of its ships. Moreover, without an operational submarine, training opportunities are few and far between. Romania is forced to rely on Turkey for ASW training with a submarine during NATO exercises. The ASW capability of the four Tetal corvettes is further weakened by the lack of an embarked anti-submarine helicopter and their limited aviation facilities. No ship of the squadron can effectively defend itself against air attacks and their sensors and anti-aircraft weapons system are mainly for point defense. As such, the ships are not effective escorts. Despite their limitations, the Tetal corvettes have participated in many national and international naval exercises in the Black Sea as well as the Mediterranean, but have not been deployed in international missions. The squadron does not possess a dedicated logistics ship, as it operates close to Romania’s shores and does not deploy oversees for long periods of time. All current ships of the squadron are slated to be replaced by a new corvette class in the near future. In late 2016 the Ministry of Defense stated its intention to acquire four multirole corvettes from Damen Schelde Galați through a direct acquisition process. The project was estimated to cost €1.6 billion. It was hoped that the Sigmas and the modernized Type 22 frigates wouldform the basis of a new naval group that would protect Romania’s shores and interests in the Black Sea as well as work with NATO ships and naval groups. Sigma class corvettes are larger than the Tetals, have aviation facilities for a medium helicopter (10t) and are equipped with modern sensors and weapon systems. In contrast with the Tetals, the Sigmas can deploy in international missions for long periods of time and can easily integrate in NATO or EU naval task forces. Revamping the capabilities of the 50th Corvette squadron is not a new idea. In 2005, after Romania became a NATO member, one of the defense programs for 2006-2015 was the acquisition of four multirole corvettes. However, the 2008 economic crisis and the subsequent reduction in defense expenditure thwarted these plans. The project gained new traction after the takeover of the Crimean peninsula in 2014 by Russia and Romania’s 2016 proposal for a NATO naval flotilla to patrol the Black Sea. Kremlin is slowly transforming Crimea into a naval bastion that can successfully interdict NATO’s access in the region and project force outside the Black Sea into Eastern Mediterranean or even further into the Indian Ocean. Operationally, the current plans to replace the Tetal corvettes pose only one issue – the ships are few. Four ships would have been considered enough before the annexation of Crimea. In the span of just two years, Russia has built and deployed six new submarines for the Black Sea Fleet – a stunning achievement. Beside these submarines, between 2014 and 2016, the Black Sea Fleet received two new guided missile frigates, a number of small missile craft equipped with land attack cruise missiles and Russia began building fast attack crafts in Crimean shipyards in 2016. Six new corvettes should be acquired by Romania in order to match the numbers of the Russian submarines present in the Black Sea. After all, the main mission of the squadron is antisubmarine warfare. Six ships mean that two are always operational, while two may be in transit or in training and the other two are in refit. In such an instance, deploying one corvette in international missions has a limited impact upon the order of battle of the squadron, and it does not significantly affect its operational capabilities. If the 50th Corvette Squadron is to deploy one ship with NATO/EU naval task forces/groups, the Romanian Squadron would not be able to adequately fulfil its missions with just four ships. Yet, politics and economics threw a spanner in the acquisition plans of the MoD. The Sigma class was selected in November 2016 by the outgoing caretaker cabinet led by PM Cioloș. The selection process, as well as the value (€ 1.6 billion) of the future contract, immediately raised questions. The would-be contract received the go ahead from the cabinet, but not the outgoing parliament which left the task to the next legislature. To make matters worse, the contract which is to be awarded to a Dutch company (Damen) became the target for nationalist rhetoric. Călin Popescu Tăriceanu, the speaker of the Senate, attacked the decision claiming that the winners are the Dutch. This view ignores the fact that all ships are going to be built in Romania, by a Romanian shipyard (owned by a Dutch company) using local workforce and a number of Romanian companies will be involved in the project. However, Liviu Dragnea, leader of the Social Democrats, the party which won the 2016 general elections, gave assurances that the project represents a priority. His commitment for this project may be undercut by the generous welfare program and tax cuts on which the Social Democrat won the elections. Furthermore, there are powerful voices within the party which call for scrapping the 2015 pledge to spend 2% on defense. On January 3, 2017 a new cabinet, led by the social-democrat Sorin Grindeanu, was sworn in. The new minister of defense, Gabriel Leș, who previously headed the ministry’s arms acquisition department, signaled that a tender may be launched in order to acquire new corvettes, instead of continuing with a direct award. However, it could mean the delay not only of the corvette acquisition program, but also of the frigate modernization, since both appear to be somehow bundled and not separate. Despite the political wrangling, navy officials have signaled that the corvette replacement program should start in 2017. On February 22, in a major policy shift, Liviu Dragnea called on Sorin Grindeanu’s cabinet to cancel the previous government’s decision concerning the selection of the Sigmas and resubmit it for Parliament approval. Sorin Grindeanu has confirmed that the previous selection will be canceled and a new proposal will be submitted. The main reason for this decision appears to be the failure of the previous cabinet to have the acquisition process cleared by the parliament. Furthermore, state secretary for defense Mircea Dușa emphasized that the ministry remains committed to the corvette program which has been includded in the 2017 defense planning guidence. On March 13, Liviu Dragnea stated that the government will cancel the previuos selection and the corvette contract will be awarded following a competitive dialogue procedure. On the same day defense minister Gabriel Leș confirmed that the MoD is cancelling the previous selection and will restart the aquisition process as soon as possible. One key criteria justifying the direct award was the speed of delivery: 2.5 years for the first corvette and maximum 7 years for the entire order (all four ships). The time span for acquiring new ships will be longer in case of a competitive dialogue procedure. Even in this case, Damen Schelde Galați will likely be the top contender since it is the only shipyard in Romania capable to build the naval vessels, reasonably fast and at a competitive cost. For example, Malaysia is acquiring six Gowind class corvettes for $2.8 billion (approximately € 2.6 billion) while Germany is acquiring five K 130 Braunschweig class corvettes for €1.5 billion. One paradox is that Romania has maintained its status as a naval vessels producer without having a naval building program in the past 20 years. Damen Schelde Galați has been the only shipyard in Romania to build new naval ships lately which, with one notable exception, all went to foreign governments. According to the Ministry of Defense, Damen Schelde Galați is the only NATO certified shipbuilder in Romania and, therefore, the technical risk is lower compared to any other local shipyard. If the current government looks at another Romanian shipyard for the development of the corvette program, it may find itself in Poland’s situation, where a similar project was awarded to a shipyard which lacked the know-how to build military vessels. Eventually, after only one ship had been built, the project was stopped due to cost overruns. If all of the four ships are built in Romania, the industrial base for building other types of surface combatants such as frigates, fast attack craft or large landing ships (LSD) will be further consolidated. However, the main arguments for the Sigma acquisition were strategic and political. Taking its cue from the failed Russian bid to acquire the Mistral class amphibious assault ships from France, the MoD emphasized that building locally means that a foreign power has little chance of interfering with the acquisition process. For sea control missions in the EEZ and territorial waters, fast response, as well as coastal defense, the Romanian Navy relies on the 150th Naval Missile Squadron. 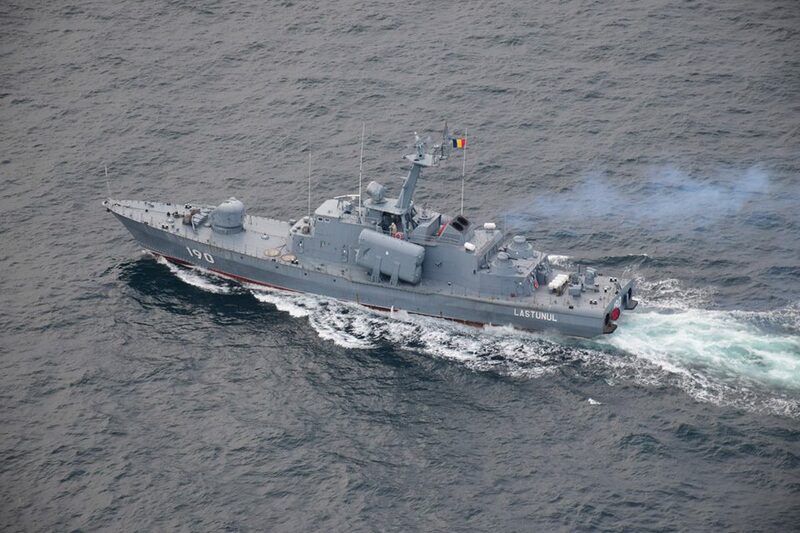 The unit is made up of three Tarantul I class fast attack crafts and four mobile 4K51 Rubezh coastal defense systems. The 585th CBRN Company is part of the unit and provides warning and decontamination in case of WMD strikes. Its main base is Mangalia. The main missions of the naval missile squadron are surveillance, patrol, search and rescue, coastal defense, securing the EEZ and Romania’s off shore oil and gas rigs. This particular unit consists in its entirety of ships and systems of foreign origin. Both the ships and the coastal defense systems have been acquired in the late 1980s and the early 1990s from the Soviet Union. Furthermore, the onboard weapons systems are of Soviet/Russian origin and are obsolete. The main weapon systems of the squadron is the P-20/P-21 Termit missile (SS-N-2C/D Styx), an anti-ship missile developed in the Soviet Union in the 1950s and updated in the 1970s. Its size, limited range and lack of electronic counter-counter measures (ECCM) makes the Styx largely ineffective against modern air-defense systems, close in weapons systems (CIWS) and electronic counter measures. Each Tarantul I is equipped with four missiles and each mobile launching unit with two. 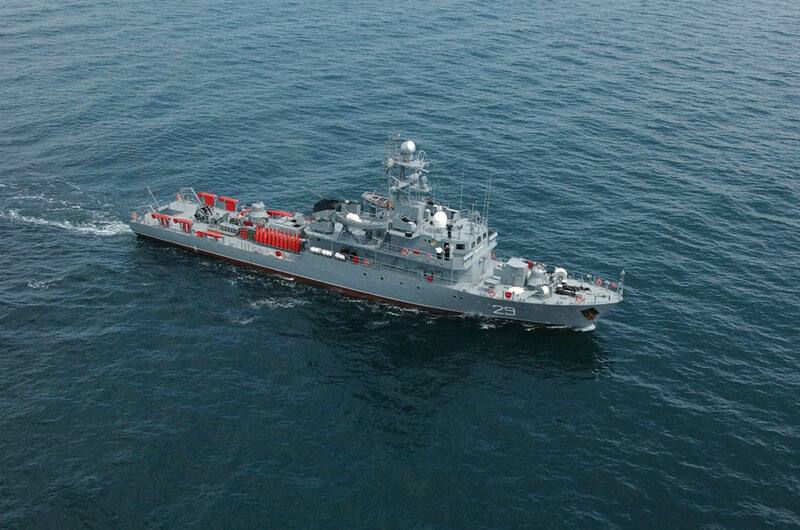 The Tarantul I class fast attack crafts along with Mărășești are the only surface combatants in the navy having, at least on paper, full anti-surface warfare capabilities, with their combination of anti-ship missiles and guns. As with other major units of the Romanian Navy, the 150th missile squadron combat effectiveness suffers from being equipped with obsolete ships and weapons. In NATO, only Romania and Bulgaria operate Tarantul I fast attack crafts, Poland decommissioned all of its vessels of this type by 2013 and Germany retired all of the ships inherited from the German Democratic Republic (DDR) in the 1990s. Protecting the offshore oil and gas rigs from raids or illegal takeovers is hampered by the inability of the squadron’s ships to effectively deploy special forces. Maintenance is difficult given the poor state of Romanian-Russian relations and sanctions imposed on Moscow in 2014, which affects operational availability. Furthermore, the Styx missiles are not produced anymore and the stock available for operations may be in short supply. Romanian officials have routinely expressed their wish to upgrade the Tarantul I missile corvettes but no program or tender has been announced until 2017. In the first phase of the program (2017-2020), two ships are to be modernized and upgraded, while in the second phase (2020-2026), the third ship should be upgraded. This raises a number of issues concerning opportunity costs and the ship’s combat value. First is the issue of age – these ships are over 20 years old. For a small surface combatant, this is close to decommissioning age. Second, the funds spent on refurbishing these ships could be allocated to acquiring new vessels of the same type, if the Romanian Navy believes in the value of fast attack crafts. Third, missile boats are vulnerable to air attacks carried either by fixed wing aircraft or helicopters. The small size of this type of naval vessel limits the type of sensors that can be installed on board and the Romanian ships capabilities have been further diminished by the Soviet/Russian policy of exporting downgraded military equipment to their allies and satellites. Moreover, one of the main advantages of the fast attack craft (its small size) is also its Achilles heel as this usually translates in poor sea keeping qualities, poor habitability (even for small crews), high maintenance costs and few upgrading opportunities. Although supporters of small combatants emphasize the lower costs involved in owning fast attack crafts, while having the same ASuW capability of a guided missile frigate, in practice, this type of vessel is expensive to maintain because of its light construction. Rather than try to upgrade the Tarantul I missile corvettes, the Romanian Navy should give careful consideration to the future of littoral and coastal defense capabilities. There has been a visible shift towards larger and longer ranged ships such as the German K 130 Braunschweig corvette which replaced all of Bundesmarine’s fast attack crafts. Poland may follow suit by acquiring a series of specialized ships for coastal and littoral defense. These plans and solutions should be carefully considered given the fact the Bundesmarine and the Polish Navy operate in a maritime environment similar to that of the Romanian Navy. After Crimea’s annexation and the subsequent military buildup in the peninsula, the Romanian decision makers have signaled their intention to acquire new coastal defense batteries to replace the outdated Rubezh systems and acquisition procedures are slated to begin in 2017 and the 508th Coastal Defense Missile Squadron is going to be reestablished. This is a sensible course of action given Romania’s coastline, offshore interests and aging fleet. The geography of the Black Sea increases the effectiveness of these type of weapon systems as it diminishes the reaction time of air defense aboard ships. Furthermore, coastal missile batteries are one of the few effective A2/AD systems Romania can afford. The attack on the Israeli Hanit corvette in 2006 has shown that these weapon systems are effective, even if used in less than ideal conditions. On October 1, 2016, HSV Swift, a UAE chartered high speed transport vessel used in the conflict in Yemen has been severely damaged after being attacked by Houthi rebels with land based anti-ship missiles. The Houthi rebels attacked with the same Iranian provided C806/Noor coastal defense system the American destroyer USS Mason and the amphibious assault ship USS Ponce on October 9, 2016, with no effect. USS Mason, an Arleigh Burke class destroyer equipped with the Aegis Command and Control System, was attacked repeatedly on October 12 and 15, again with no effect. As in the case of the fast attack crafts, Romania should take its cue from the developments taking place in the Baltic. 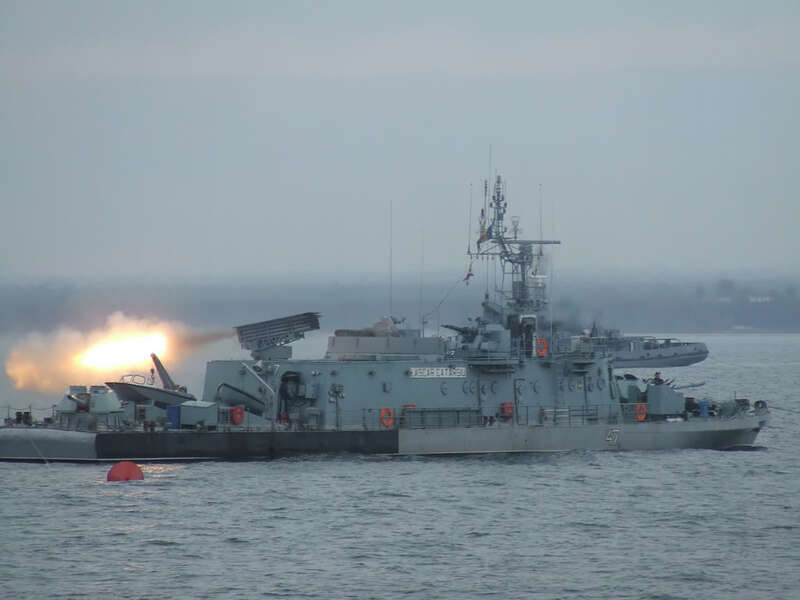 In 2008, Poland has acquired Kongsberg’s Naval Strike Missile (NSM) to equip its coastal defense forces and, in 2014, has ordered a new batch of missiles to equip another coastal defense brigade. Russian assertiveness in the Baltic Sea has forced Sweden to rebuild its missile defense capabilities and to literally scrounge RBS-15 missiles from depots and other equipment from museums (!) in order to deploy a coastal defense unit on the strategically important island of Gotland. If Romania is seriously interested in re-capitalizing its coastal defense forces, it has four options available: the Norwegian Kongsberg NSM system, the Swedish Saab RBS-15 system, the Italian MBDA Marte 2 ER missile system (if a shorter ranged system is wanted) or the French MBDA Exocet 3 missile system. An aviation capability should be added to the missile squadron by employing naval helicopters for surveillance and/or ASuW missions or by deploying unmanned aircraft. Mine warfare in the Black Sea dates back to the Crimean War (1853-1856) and the Russo-Turkish War of 1877-1878. In both World Wars, the Black Sea and the lower Danube were heavily mined both by the Axis and the Allies. To this day, the naval mine is the cheapest way to sink or disable a ship either on high seas or in coastal waters. Mine clearing is one of the most dangerous and specialized missions a navy undertakes in times of peace or war in order to maintain the sea lanes open. Therefore, it should come as no surprise that the Romanian Naval Forces have a dedicated mine warfare unit. The 146th Mine Warfare Squadron consists of one mine layer and four minesweepers and operates out of Constanța. All ships of the squadron have been designed and built in Romania as part of the naval program of the Communist regime. Originally, two Cosar class mine layers had been built in the early 1980s, but one was decommissioned. The four Musca class minesweepers were built in the late 1980s and all of them are still operational. Beside their primary mission, these minesweepers have a limited antisubmarine capability and can serve as escorts. As is the case with the rest of the fleet, the ships of the Mine Warfare Squadron are obsolete and have limited interoperability with NATO. The current state of the mines stock is unknown and all of them are of Soviet/Russian design which makes replacement rather difficult. The Musca class minesweepers have their hulls made of steel and not of glass reinforced plastic (GRP) as is generally the norm with mine warfare vessels and, as such, they are vulnerable to influence mines. Moreover, the ships are not equipped with high resolution sonars to help them locate and identify mines, nor are they equipped with remotely piloted vehicles (ROVs) to help them dispose of mines. True, these ships are not mine hunters, but they could have been effective mine counter measures vessels (MCMV) given their size. As of now, the future of the squadron seems to be in limbo, despite its ships participating in many NATO exercises in the Black and Mediterranean Seas. Initially, Romania was to acquire four mine hunters, but these plans never materialized because of the economic crisis. Instead, the acquisition was postponed and an interim mine warfare capability is sought – probably the Musca class minesweepers are to receive a number of upgrades. However, plans regarding the replacement of Contraamiral Constantin Bălescu (274) minelayer have not been put forward. As of December 2016, the ship was undergoing a refit to upgrade its communications and sensors. Securing control of Danube’s lower course and its delta has been one of Romania’s main naval interests since its creation as a modern European state in 1859. Historically, Romania has maintained strong riverine forces and, at present, it does the same. Romania’s Danube flotilla is the strongest and most powerful force of its kind in NATO and Europe. The Danube flotilla consists of three major units: 67th Artillery Carrying Ships Squadron, the 88th Patrol Gunboat Squadron and the 307th Marine Infantry Battalion. The strongest unit of the force is 67th squadron which consists of three river monitors and five armored gunboats. Both types of ship are heavily armed and armored. All ships are equipped with 100 mm cannons and 122 mm Grad rocket launchers as well as light artillery of various calibers. Their missions are to secure the Danube, protect Danube’s Delta and its waterways and provide naval gun fire support for the land forces units protecting the mouths of the Danube. The main mission of the 88th River Patrol Boat Squadron are surveillance, protecting the freedom of navigation on the river, securing Danube’s ports, mining, minesweeping and naval gunfire support. The squadron employs small and lightly armed ships that can operate on the river or in the delta where bigger ships can’t. In this way, the patrol gunboats complement and support the activities of the 67th Squadron. All the ships of the 67th riverine squadron are designed and built in Romania in the late 1980s and early 1990s. Their weapons systems are of Romanian design and manufacture which greatly facilitates maintenance and supply – however, these are in Warsaw Pact calibers. Furthermore, the ships suffer from a lack of modern sensors and air defenses. The five armored gunboats in the squadron are slated to have their engines replaced starting this year. Eventually, the three monitors will undergo the same process in the near future. The Danube flotilla is the only naval unit in the Romanian Naval Forces that has an organic amphibious capability. The 307th Marine Infantry Battalion is the unit that provides this capability. Its main missions are: the defense of the Danube, Danube’s Delta and Dobrogea’s lagoons from raids, incursions or amphibious operations. Other missions include surveillance and protection of the Danube’s waterways, peace support operations, military assistance to the civilian authority, search and rescue and CBRN reconnaissance. The Romanian Marines have been deployed to Kosovo in order to support the peace process in the region and regularly take part in national and international exercises. The Naval Special Operations Squadron formerly known as Naval Special Operations Group (GNFOS) provides the Romanian Naval Forces with a special warfare capability. The squadron in its current form was established after Romania became a member of NATO. Its preceding special forces structure was centered around the 39th Diving Center which trained explosive ordnance disposal divers (EOD) and combat divers (“commando frogmen”, “incursori”). Naval special operators are trained in diving, combat diving, mountain warfare, demolition, survival, parachute training, mobility and vehicle maintenance. Insertion and extraction is done by high speed boats, rigid inflatable boats, helicopter and parachute. The special forces component was created with the aid of NATO allies in particular U.S. Navy’s SEALS and the unit regularly takes part in international exercises. A small detachment was deployed in Afghanistan as part of Romania’s contribution to the ISAF mission and another was deployed on board Regele Ferdinand (F-221) during Atalanta antipiracy mission. Lately, GNFOS exercises have emphasized the protection of offshore oil and gas rigs. The present overview indicates that, under the current force structure, the Romanian Naval Forces are unable to fulfill their missions effectively. Twenty years of naval building holiday have certainly left a big capability gap. Deterring and defending against a potential aggression from the sea are seriously hampered by the current state of the Romanian Naval Forces. Its ships are outdated and cannot adequately face the challenges of modern naval warfare. Worse, the Romanian navy has limited interoperability with other NATO naval forces. As a result, in naval terms, Romania failed so far to leverage its membership in NATO. Only in training and procedures did the Romanian navy benefit from being a member of the most successful alliance in history. Currently, the navy can adequately fulfil only constabulary and surveillance missions in the Black Sea or during international missions. Anti-submarine warfare, anti-surface warfare and anti-air warfare cannot be conducted at the level demanded by the needs of modern naval warfare and NATO standards due to a lack of modern equipment. The Russian military buildup in the Black Sea and its willingness to employ force to settle international disputes further emphasizes these vulnerabilities. Efforts are underway to modernize the force, however, these may be hampered by politics and the evolution of the economy in the short and medium term. Further develop naval special warfare capabilities in order to counter the so called “hybrid warfare” tactics especially in the EEZ. By reading and/or downloading this document you agree and acknowledge all ROEC Terms and Conditions. © 2010-2019 ROEC, Romania Energy Center. All Rights Reserved.